Pierre Westie: “Thank you, Bentley. We have reported the trouble that some airlines have when transporting dogs but this one takes the dog biscuit. Gale, a 22-month-old American Staffordshire Terrier show dog broke out of her crate as she was being loaded into the cargo area of a KLM flight from Atlanta’s Hartsfield-Jackson International Airport to Amsterdam. She had just attended her last event before retiring to live with her owners. They were booked on a different flight and Gale was supposed to be on the same flight as her handler. Obviously, she had other ideas and I can’t blame her. Who wants to ride in cargo all the way to Amsterdam? Bentley: “This next story is so sweet, but it does tug at your heartstrings. We think you’ll enjoy it. Gretchen was a newly rescued German Shepherd in 2013 and gaining her trust was not an easy task. She loved her new family but few others. That was when a very unusual friendship was born. The local postman is a dog lover and carries treats to share with the pups on his route. He slowly won Gretchen over and she eagerly waited for his daily visits. The treat tradition continued for years until earlier this month. When the postal truck arrived at the house, the mail carrier saw that the flag was up meaning outgoing mail. Inside was a note with a bag of treats. Gretchen had crossed the Rainbow Bridge and her family asked the mailman to please share the treats she didn’t get to eat with the other dogs on his route. With tears in his eyes, he drove off to fulfill his buddy’s last wish. Pierre: “I love German Shepherds. They make such awesome police K-9s. Just the other day a K-9 named Bane in Powhatan, Virginia was hailed as a hero after finding two eight-year-old children. The kids had been missing in the woods for about 45 minutes when parents and neighbors called the local sheriff’s department. 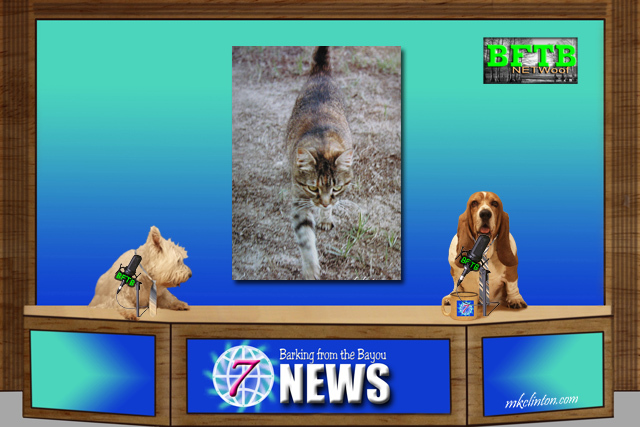 Bentley: “It just wouldn’t be a newscast without a great cat story and this one is pawsome! During a recent fashion show in Turkey, a cat wandered onto the runway. It proceeded to groom and take swats at the models as they sashayed past the adorable feline. I guess we now know why it’s called a catwalk! 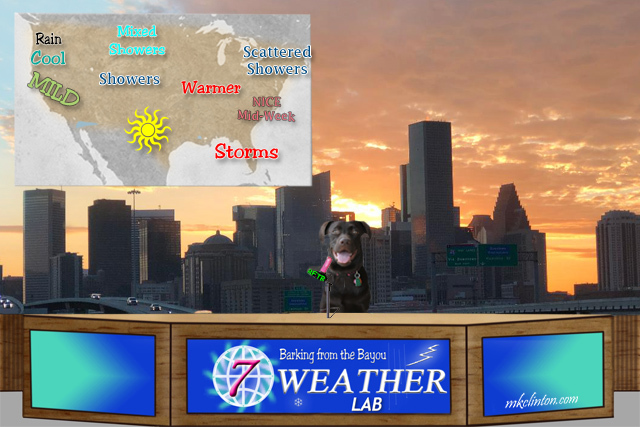 Paisley the Weather Lab: “Well, the weather won’t be as big of a cat-astrophe as that last joke! It’s actually not going to be so bad for most of the United States. Let’s start with the Pacific Northwest where it’ll be cool with some rain. As we look across the northern states, you’ll notice there is a mixture of snow and rain showers. Winter is holding on as long as possible for y’all! The scattered showers will be in the New England states and if you are living along the east coast, you will have nice weather beginning midweek. The Florida panhandle is going to be stormy but most of the Gulf Coast region will be sunny. We are expecting sunshine here in the Lone Star state and after a stormy weekend, we are ready for it. The southwest will be warm and sunny with the west coast looking at mild temperatures. The center of the country will have showers and temps should be warmer. Stay tuned to your local stations for updates or warnings. Bentley: “I am not ashamed to say *Treatibles helped me make it through the storms. Mom and Dad were so happy they gave me the Soft Chews before the first clap of thunder! I was cool as a cucumber and didn’t pant or pace at all. 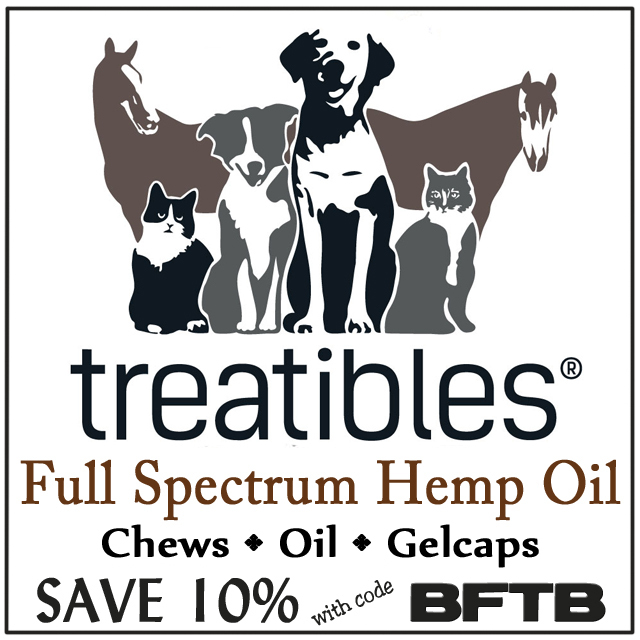 Have you tried Treatibles for your pet? Haha! A cat on the catwalk! Too funny! Soooo, why I've I got one of those Mr Postie's that give out TREATS??? I'm going to put my paw down and get the peeps to find me one of them!My Mr Postie is soooo MISERABLE! A nose work friend left her dog in it's crate in the hotel room and went to dinner. When she came back, the door to the room was open and the dog was gone. 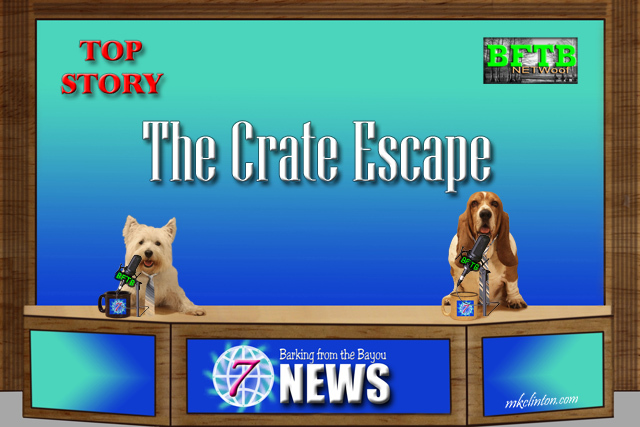 It opened the crate, opened the room door because it was a lever handle, made it to the lobby where there were automatic doors and was out. They looked almost all night for the dog in the town and finally found it. Scary stuff when dogs bust out! Have a fun week! My NC associate Angus flew across the ocean from London to be with his family when they moved. He made it without any problems, thankfully. Good report! What wonderful stories of love and devotion today. Love the story about the cat. Thanks for making some minor changes on commenting. It's so hard to lose a furry family member. What a bunch of great stories today! We have to admit we got a little choked up at the story about the postal carrier and the German Shepherd. What a sad but heartwarming story about Gretchen and her wonderful family!!! 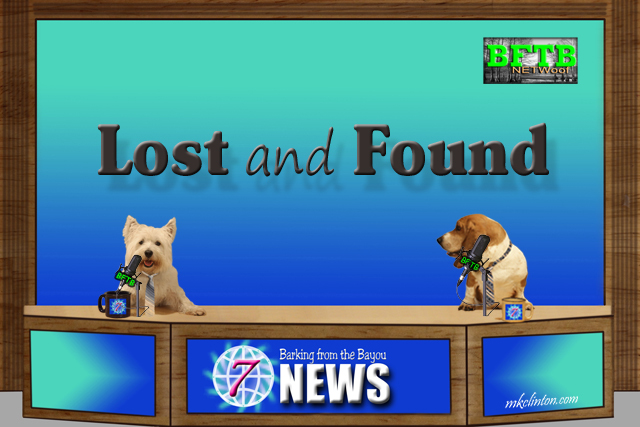 We saw that story about Gale and were so happy she was found safe. I hope someone rescued the runway cat if it was homeless.Glad Gale was found. 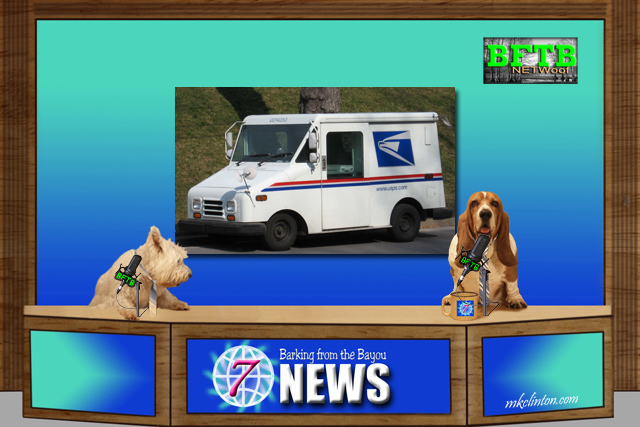 Dogs all across the country are amazed to know that mail carriers are not all bad! Now if we could just clue Luke into that!